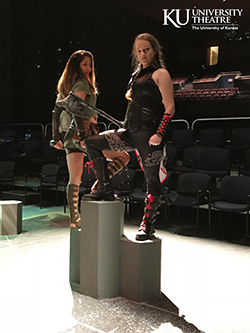 LAWRENCE — “She Kills Monsters,” an action-packed and comedic play written by Qui Nguyen, will open Friday, Dec. 1, at University Theatre. Audiences young and old will enjoy the play, but it will especially appeal to gamers. The role-playing game Dungeons & Dragons is used as the framework for the story of Agnes, a young schoolteacher who connects to her late sister by following her sibling's footsteps through the adventure and fantasy of D&D. Add to that a good mix of music and imagery of the ‘90s, and this play is fully rooted in pop culture. 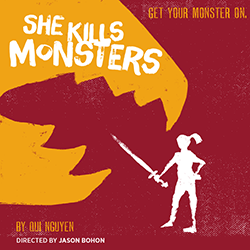 University Theatre’s production of “She Kills Monsters” will be performed in the round on Stage Too! inside of the Crafton-Preyer Theatre. Audiences will be close to the stage, “a great vantage point to get swept up into the action,” Bohon said. Tickets for “She Kills Monsters” are on sale now at KU ticket offices and online at www.kutheatre.com. Tickets are also available by calling the University Theatre, 785-864-3982, and the Lied Center, 785-864-ARTS. Tickets are $20 for adults, $19 for senior citizens and KU faculty and staff, and $10 in advance, $15 at the door for KU students. Members of the cast and crew include Sarah Van Zwoll, Overland Park senior, as Agnes; Becky Phelps, Cedar Rapids, Iowa, sophomore, as Tilly; Hunter Hill, Sabetha sophomore, as Chuck; Brandon Hedger, Mansfield, Texas, junior, as Miles; Natalia Sarmiento Acosta, Bogota, Colombia, senior, as Kaliope/Kelly; Abbey Lynn Smith, Altamont senior, as Lilith/Lilly; Lusie Cuskey, Louisville, Kentucky, graduate student, as Vera; Elsa Bernauer, Leawood sophomore, as Narrator/Farrah; Stella Garibaldi, Kansas City, Missouri, freshman, as Evil Gabbi; Teagan Fitzpatrick, Overland Park senior, as Evil Tina; Jakob Reitz, Seneca sophomore, as Orcus/Ronnie; Matthew O’Brien, Kirkwood, Missouri, sophomore, as Steve; Visiting Assistant Professor Jason Bohon, director and fight choreographer; Kate Smeltzer, Prairie Village graduate student scenic designer; Liz Mitts, Lawrence senior, lighting designer; Chelsea Pitts, Topeka graduate student, costume designer; Nathan Traxler, Topeka junior, sound designer; Amy Billroth-MacLurg, fight choreographer; Sarah Stowell, Scottsdale, Arizona, freshman, assistant director and dance choreographer; Gabrielle Smith, Lansing freshman, dance choreographer; Charlotte Nodarse, Leawood, senior, dramaturg; and Emily Hunsucker, Boca Raton, Florida, sophomore, stage manager. “She Kills Monsters” includes adult language and fantasy violence. It may not be appropriate for all audiences. Strobe lights and water-based theatrical fog are used during the production.